Professional venues can change the acoustics of a room with movable partitions and high-end wall finishes and ceiling tiles. High schools, however, often don't have the luxury of pouring millions of dollars into these features. 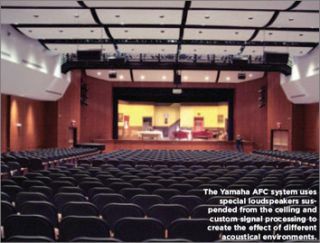 As a cost-effective alternative, Victor Senior High School in Victor, NY opted for Yamaha's Active Field Control (AFC) reverberation enhancement system, which allows staff members to change the reverberence, loudness, and perception of spaciousness in the auditorium electronically. The top-ranked high school invested $26 million in the renovation of their 925-seat auditorium. As part of the project, the construction team spent a year-and-a- half improving the acoustics and lighting, building a fly loft, increasing the stage space, and adding more seating, says Matthew Abate, project manager for Rochester, NY-based Stantec Architecture, which hired AV experts to design and install the system. The AFC system, which cost $125,000 to install, gives students the opportunity to experience what they would sound like in a professional live concert hall versus a traditional high school auditorium, says Aaron Isaacs, the audiovisual coordinator for the Victor Central Schools. Before the renovation, the room had an overly reverberant sound quality with unbalanced frequency content, says Seth Waltz, principal consultant with AVL Designs, a Penfield, NY-based full-service theatrical consulting firm. In other words, the old space had poor acoustics and sounded "muddy," Waltz says. Good room acoustics provide articulate, yet blended, sound for larger ensembles. In contrast, rooms with poor acoustics can accentuate one instrument group over another, rendering a performance unbalanced. stage, the sound projects throughout the auditorium, and audience members hear sound with the correct balance throughout the room. Since the new auditorium opened its doors last October, the performance is consistent from the front to the back of the room, and it's a better sounding space, Waltz says. "I was there the day the teachers came over and demonstrated with the choral group on stage. They wouldn't perform without it now that they have this option," he says. "Professional orchestras have also been in the auditorium, and they're amazed with how it sounds." During the "tuning" phase of the system installation, where different student ensembles tested the acoustics, Dupra says the students could tell the difference. "It was interesting to be a part of it, and it was neat to hear the different sounds," she says. "The kids' eyes lit up when they turned on the cathedral sound [setting] and turned on the reverb to their voices." Good acoustics are essential for a high school auditorium, Waltz says. "If you put talented performers on a stage in a room with poor acoustics, the audience will be distracted by the way the performance sounds," he says. "While a typical audience member may not be able to pinpoint exactly what bothered them, they won't fully enjoy the performance." "Without an acoustic enhancement system, the audience is less able to appreciate the talent of the music the students are trying to produce," says Barbara Rubenstein, music department coordinator for the high school. "We had such limited capabilities prior to the installation of this new system, and now, it's a real pleasure to perform in the auditorium and to be an audience member in the auditorium." This acoustical versatility is especially important because the auditorium, which is one of four venues on the school campus, needed to be designed for any event from a fourth-grade holiday concert to a high school theatrical production. Acoustics need to be different for performances such as a rock band or a choral ensemble because each type of performance uses the sound space differently, Dupra says. For example, while a rock band would plug in their electric guitars into an amplifier, musicians who are playing a violin aren't using an amplifier to manipulate the sound. Waltz experienced the difference between a traditional loudspeaker system and the acoustic enhancement system at Yamaha's demo facility in New York City. He listened to a pianist and a string quartet in a room equipped with loudspeakers in the ceiling. If he closed his eyes, he could have sworn he was standing in a 600-seat auditorium, rather than a 30-foot by 20-foot room. "You could stand directly under the loudspeakers and not know they're there," he says. "You feel like you're in a much larger room, and you would feel that the room couldn't possibly do what you were listening to." He got the same feeling when he installed the AFC system at both Victor High School and Vestal High School, another New York state public school some 150 miles to the south of Victor, which was the first AFC installation in the United States. Victor staff members visited with music instructors at Vestal, and after being impressed with the variable acoustics of their auditorium, they decided to follow in the school's footsteps. At Victor High School, four Audio- Technica microphones are ceiling mounted and connected to the AFC processors, which then distributes signals to 32 independent speakers that go all the way to the back of the room. The sound system and amplifiers for the AFC system are totally independent from the auditorium's main sound reinforcement system. Although the loudspeakers are installed in the ceiling, the effect of the system creates the illusion that the sound is coming from the side walls. This gives the listener a sense of the room's size and creates the excitement of "live" music. Waltz compares the acoustical trick to surround sound in a living room. "When you're listening to a band, you want the energy to come in from the side walls," he says. "With this system, you can program the energy to come in from places where the loudspeakers aren't actually located, and people can tune it based on the room parameters." Due to the system, there is not a bad seat in the house. "Before, there was very little acoustic enhancement, and what you heard was cominglive from the stage," Rubenstein says. "One of the unique features of this system is that it doesn't matter where you sit or how far you are from the stage because you'll hear everything the same way." located in the back of the house or backstage. To make it even more user-friendly, Yamaha set up the system with a manual and automated setting. For example, a group can select the automated setting if they're going to have a short meeting in the auditorium. Or, for a musical performance, a trained staff member can manually select the most appropriate preset for the event. "You can provide a high school with professional level capability without breaking the bank," Waltz says. Amy Fischbach is an Overland Park, KS-based freelance writer and editor. She has nine years of professional experience as a journalist and serves as the national vice president of the American Society of Business Publication Editors. She can be reached at amyfischbach@gmail.com. Amy Fischbach is an Overland Park, KS-based freelance writer and editor. She has nine years of professional experience as a journalist and serves as the national vice president of the American Society of Business Publication Editors. She can be reached atamyfischbach@gmail.com.